I recently gave a short talk on “Designing learning, training and workspaces for VR” at the annual conference Nordic VR Forum at Hamar, Norway. Key takeaways were that architects are uniquely positioned to design good virtual architectural spaces, that humans thrive in environments that are rich and complex (such as nature), and that ceiling height and room colors affect how we think and perform mentally such as when doing problem solving. While photo realism is not needed to achieve a strong sense of presence in VR, rich and realistic designs and environmental storytelling help put the player in the right mood and understand what to do which is helpful for work, training and learning experiences alike. Being somewhere in immersive VR is similar to being somewhere in the “real world”, and as such studies on how our built and natural environments affect us are valuable in informing virtual design. Winston Churchill famously said “We shape our buildings and afterwards our buildings shape us”, and epidemiologists have found that people raised in cities are more prone to mental disorders than those raised in the countryside and neuroscientists have found a that people living in cities as opposed to rural areas have a much higher risk of schizophrenia. In a study at the University of British Columbia in 2009 people were put in rooms of different colors and asked to perform tasks. People in the blue group performed worse on short-term memory tasks, but did much better on those requiring imagination, such as designing a children’s toy out of simple geometric shapes. Psychologist Meyers-Levy, at the Carlson School of Management, conducted an experiment examining the relationship between ceiling height and thinking style. They generated twice as many “creative outputs” as subjects in the red condition. When in high-ceiling rooms people excel at puzzles in which the answer touches on the theme of freedom, such as "liberated" and "unlimited" and this is because airy spaces prime us to feel free. The design of “real world” and virtual architectural spaces have real cognitive consequences. Still from my design of the blue changing room in the “Can’t Get Over” music video with artist September. Throughout history we have seen how new art forms borrow from previous ones, like film borrowing from theater. Now VR is borrowing from both film, games and theater. In immersive theater viewers are immersed in the set, and the design and lighting are crucial in supporting the story and putting the audience in the right mood. In movies, in particular science fiction flicks, the environments play a big role in supporting story and characters and in video games the elements and story in the surroundings aid the player in where she should go and what she should do. In VR, the design of the environments are more important than in any previous medium since the player can linger and even pick up and examine objects with their hands. This is why every little prop, art piece and furniture you put into a scene should support the story and aid the players in what to do. The right amount of dirt: a 360 panorama of a mixed reality VR prototype for industrial training done at The Future Group. While the numbers of daily VR users world wide are still low, future generations will spend a lot of time in virtual environments and many will likely be going to school, playing, working and meeting in virtual reality. Creating good, comfortable virtual spaces that contribute to our well being and that enhance learning, training and working will therefore be key. In the entertainment industry game and level designers have a long history of using lessons from architecture when designing games and levels to improve spatial layout, game play and to evoke emotion, all using architectural theory. With immersive, room scale VR experiences that are architectural (even in games) it is key to get proportions and relations between familiar objects right as they otherwise give the player a wrong sense of scale. Illuminating the design properly with natural and artificial lighting, choosing an appropriate parti and a spatial arrangement for the type of activities to take place in the space and creating a design that it is easy to orient oneself in and that is comfortable are all tasks that architects excel at. While not all architects will be interested in designing virtual spaces, nor will have the CG skills to model, light, texture and optimize scenes for real-time performance, I believe architects are uniquely positioned to design great comfortable and effective VR spaces for learning, work, and play. 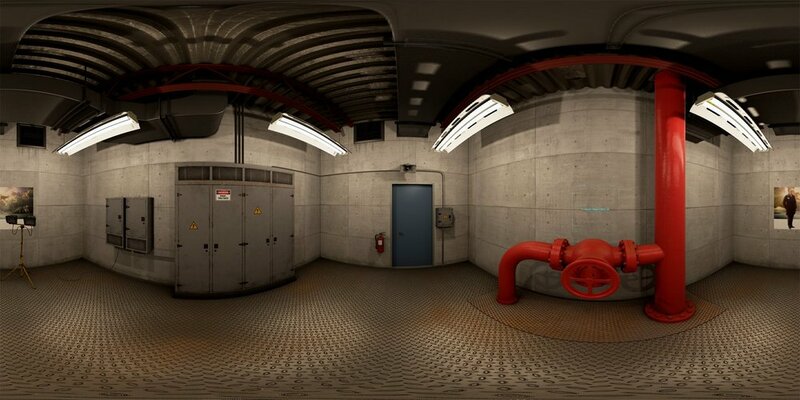 A 360 panorama of my concept model for a recent version of HoloCap Studio.